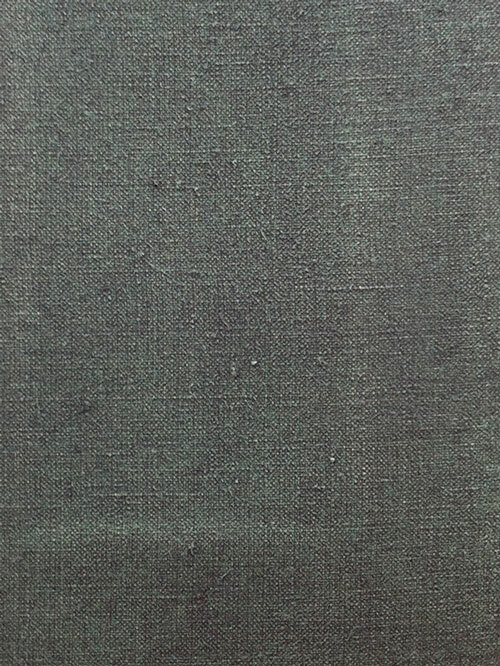 This installation of paintings by Steven Anderson (stevenanderson.info) is part of an ongoing series whereby each painted canvas is reduced to predefined minimal means. Looking like an x-ray of a canvas or the back of a painting, they are worked-objects as much as paintings. Through a process of painting on, then wiping off black oil paint from a clear primed linen ground, the work reveals the texture of the cloth and the structure of the wooden stretcher frame. Process and repetition are fundamental features of this body of work. In a performative sense the activity of ‘doing’ the work is the subject of the paintings. The paintings perform the activity of their own making. A key reference for this work is the value found in things imperfect and incomplete within the Japanese aesthetic of wabi-sabi. The beauty of an object in the process of becoming or else disintegrating indicates the transforming independence of each painting within the extended timeframe of it existing. The opposite of a colour, as it doesn’t reflect light, the black pigment in these paintings is not an image-making medium. Instead the black is treated as material substance as is the linen fibres and the wood of the support. To layer on and wipe away black is allegorical for something and nothing, light and darkness, life and death, crudeness and beauty. An aim of these paintings is for the polarities to exist together as a singular reserved presence; tonally balanced by what is left behind. Steven Anderson lives in Glasgow. Having graduated from painting at GSA in 1997 and an MFA at DJCAD in 2008, Anderson also makes performances, which present unaccompanied vocals, audience participation and artifacts alongside each other. Previous shows include Beyond Here Lies North at the Arbuthnot Museum in Peterhead, Your Leaning Neck at the Scottish National Portrait Gallery, Edinburgh and Peacock Visual Arts, Aberdeen, Fix at Catalyst Arts, Belfast and as part of Instal'10 at Tramway, Glasgow. Anderson is currently art project coordinator at The Prince and Princess of Wales Hospice, and was recently a visiting artist and temporary lecturer for the Contemporary Performance Practice department at the Royal Conservatoire of Scotland. Next project: → "Lie Down"